Philosophy | Noble Studios, Inc.
What is Creative Digital Performance Marketing? This is not to say creative digital performance is a philosophy rooted in reinventing the wheel, though. It’s not. We accept that the wheel is a pretty damn smart invention. It spins. It rolls. It carries things. It gets you places. It works really well. However, wheels have not rested on their laurels. They’ve been optimized over time. They’ve become sturdier, lighter, faster, grippier–hell, some wheels even pay you a fortune–they’ve become generally more awesome. They’ve become better. So, best practices are the baseline. Then we strive to make best practices better through our proven approach, which includes a foundational UX philosophy, the humanization of data and digital overall, data-informed as opposed to data-driven decision making, agile creative and performance teams working together to iterate and the use of creativity and craft to drive performance. After all, marketing is driven by human behavior. Human behavior changes. Tastes evolve, technology advances, winds shift, new trends take hold. Best practices can very easily become “past practices” if we’re not paying attention. So we practice making our practices better. And better. And better practices. At the heart of this impassioned pursuit of “better practices” is the empathy-driven user experience (UX) philosophy that states we should always balance a user’s needs and goals with a company’s needs and goals. That UX approach will ensure an experience is useful and delightful rather than painful. Having started as a web development agency, this thinking is embedded in our digital DNA. However, we actually no longer call them users. They are not hypothetical personas who have historically behaved in one way or another. We have enough real-time data to see exactly how they are behaving now–and how that changes on an ongoing basis. So, we call them people. Because humanizing digital marketing is essential to success, so creative digital performance is fundamentally about people not personas. Creative digital performance marketing is about the HX (human experience). According to studies, neuroscience shows that the vast majority of purchasing decisions are made by the subconscious. So decisions are made emotionally. And emotional decisions are not always rational, which is why emotional ads consistently outperform rational ads across the digital marketing sphere. If we accept users and personas and customers and visitors are simply people, emotional humans, then that means understanding not just what people are doing when they interact in digital environments, but WHY they behave one way or another online. What psychological needs are they trying to fulfill? What are their interests? What is their intent? Where is this PERSON in their path to purchase? Creative digital performance marketing means thinking empathetically about what someone wants when you are creating campaigns and content, when you are executing a digital media plan and developing digital experiences. How can we reduce the friction they’re facing, reduce anxiety, be more inviting, fill them with excitement, give them a sense of community, challenge them, etc.? How can we be useful and awe-inspiring instead of painful and awful with our digital experiences? We are all inundated with thousands upon thousands of digital messages each day as we switch between our numerous screens countless times and challenge our attention spans to not shrivel into oblivion. We all count the seconds to click, “Skip Ad.” We all race to click the “X” so we can get to that content we can’t wait to consume. So we should strive to make people’s experiences as pleasant as we want our own. Some amount of success and results can be achieved by deploying formulaic thinking based on best practices, but this success quickly hits its limits. Better practices come from thinking about the humans you’re trying to connect with. This takes creativity and craft. That type of data analysis, which helps us understand the “why” of people’s behaviors, pull out key insights and come up with meaningful hypotheses, is what we call data-informed decision making. As opposed to data-driven decision making. Data should be directional. It should inform decision making. It shouldn’t drive decision making. That’s the tail wagging the “data dog.” The danger is developing a limited or narrow view into data that can lead to assumptions that miss the big “aha” moment. And missing the “aha” moment is missing your chance to create better practices. So when we pour through analytics and leverage data, keeping both customers’ (people!) objectives and our clients’ objectives in mind, we are guided by decades of experience, analytical intuition, psychology, creativity and a bit of magic. The success of this data-informed approach relies on multiple perspectives. The crux of creative digital performance marketing is having performance and creative teams working hand-in-hand to achieve our clients’ goals. That’s why we are set up in interdisciplinary teams, keeping multiple perspectives involved in the creative problem solving process day in and day out. Art and science. Pencils and calculators. Big data plus big ideas. Raw imagination and results. Sure, you can move the needle with wildly creative thinking. But over time you’ll need to apply performance thinking to continue seeing increased results. And yes, you can achieve great success by applying smart performance-driven strategies. Eventually, though, results will plateau without applying creative thinking. We have two sides of our brains for a reason. 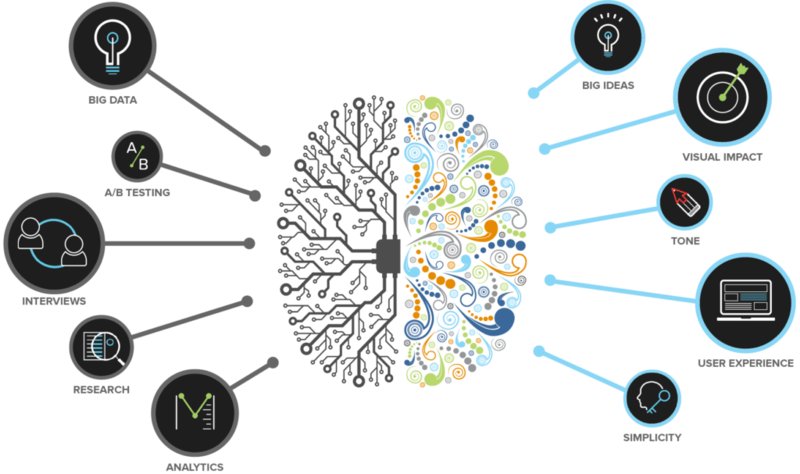 So creative digital performance is about having our teams work together to leverage both right-side and left-side-of-the-brain thinking, so we can hypothesize, imagine, analyze, iterate, craft and create outside-of-the-box solutions. We start with that baseline we discussed by beginning with best practices. Then we ask, “What if?” What if we tried this? What if we tried that? And as results come in, we ask “Why?” Why are people behaving the way they are? Are they engaging, connecting and converting? If not, why not? If they are, can we improve upon that? Can we make their experience even better? Can we be more empathetic? Can we be more helpful? Can we be more successful? Can we improve our performance little by little, day over day? Can we create Better Practices? Let Noble Studios help you with your next marketing project.